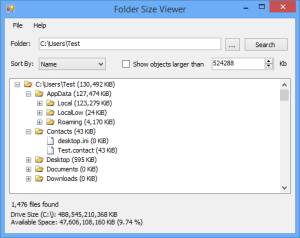 The Folder Size Viewer application allows you to see how much space each folder and file on your computer is taking up. The information is presented using a tree view which can be ordered by name or size, and filtered to only show items above a specified size. Items that cannot be read are shown in red. Run the application as an administrator to ensure all the items are visible (right click and select "Run as administrator"). Latest version v1.3 (18 May 2018). Requires Microsoft .NET Framework 2.0 or greater. Windows XP users may need to download the .NET Framework from the Microsoft website here. The official installer will install the application and create shortcuts etc. Does not contain adverts or bundled software. This zip file contains the files required to run the application. Windows may warn against running the application as it is not signed by a trusted publisher. On Windows 8 and 10, you can run it by clicking "More info" and then "Run anyway". If you like Folder Size Viewer please consider making a donation via PayPal or take a moment to leave a comment or review on a website.